If you and your family are planning a trip to Denver, Colorado, then you might be wondering what family attractions to attend so that you can have the most enjoyable trip possible. Although you can choose from a range of great activities, it’s impossible to do them all in one visit. Many people arrive and quickly become overwhelmed by the number of choices that are available, and they often miss out on many of the things that they wanted to do as a result. So, it’s important to put in the effort to plan each step of your vacation in advance. Make a list of all the things you and your family want to do, then have everyone vote on their favorite ideas, which will ensure that each person has a good time. When you are planning a family trip to Colorado, you won’t want to miss out on the Denver Museum of Nature and Science. You will discover many events from which to choose, and the children will be thrilled to see the Robot Revolution exhibit. It features some of the most advanced robots in the world. Tourists are often interested in the fact that many of these sophisticated creations were designed and built by Google and Boeing. No trip to Denver is complete until you stop at Elitch Gardens, which is a theme park that is fun for the whole family. If you enjoy rides that are fast and intense, then you will likely enjoy the roller coasters, such as the Mind Eraser, Sidewinder and Boomerang. Those who prefer slow, relaxing rides will also have plenty to do at Elitch Gardens. When you need to cool off on a hot summer day, head over to the water rides, which include Shipwreck Falls and Thunder Canyon. White water rafting is an amazing experience that the whole family will love, and Clear Water is often a favorite choice among travelers. 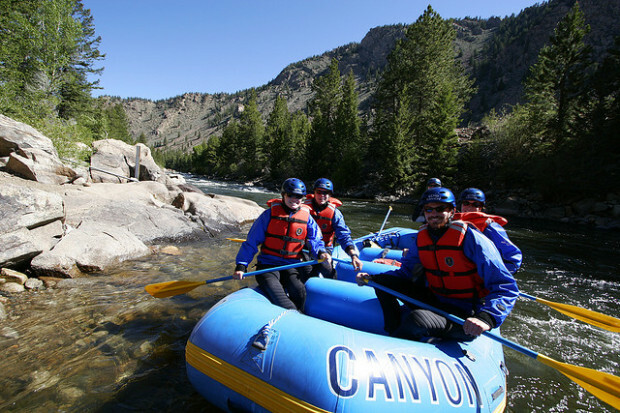 They offer different river trips depending on your level of skill and how adventurous you are feeling. If safety is at the front of your mind, then you will be happy to learn that each guide is trained in CPR, first aid and water rescue. As an extra precaution, each participant will be equipped with a coastguard approved lifejacket. Your family can embark on a peaceful bicycle ride when they are ready for a break from all the action. Denver has over 85 miles of bike paths that go through dirt roads, mountains and the shopping district. Although riding a bicycle is a relaxing experience, it’s also a great way to maintain your workout routine while on vacation. The many sights along each trail make for great pictures, so don’t forget your camera. Denver is known for its beautiful mountains, landscapes and lakes, and you are sure to enjoy the many family-friendly hiking trails that Denver has to offer. Bear Lake Loop is great for anyone who has young children, and in addition to circling the lake, it also provides an amazing view of the wilderness.